세병관(국보 제305호)으로 오르는 길가 오른쪽에 서 있는 석장승이다. 장승이라는 명칭은 지역에 따라 다르게 전승되고 있는데 이곳에서는 ‘벅수’라고도 한다. 장승은 민간신앙의 한 형태로 마을이나 사찰 입구 등에 세워져 경계를 나타내기도 하고 잡귀의 출입을 막는 수호신 역할도 한다. 남녀 한 쌍이 짝을 이루어 서 있는 것이 일반적이나 이 장승은 하나만 있는 독장승이다. 이 부근의 위치가 사방이 산으로 둘러싸인 낮은 지대로 기(氣)를 보강해주고 마을의 평안을 기원하는 뜻에서 세워졌다. 이마에는 주름이 깊게 패여있고 둥근 눈은 튀어나왔으며 코는 삼각형으로 뭉툭하다. 머리 위에는 벙거지를 쓰고 턱 밑에는 굵은 선으로 세 가닥의 수염이 표시되었다. 활짝 웃고있는 입에는 송곳니가 길게 삐져나와 있는데 험상궂은 모습이기 보다는 익살스럽다. 벅수의 앞면에는 ‘토지대장군(土地大將軍)’이라는 글자가 새겨있다. 뒷면에는 '광무십년병오팔월일동낙동 입(光武十年丙午八月日同樂洞 立)'라는 글씨가 새겨져 있어 이 벅수가 고종 10년(1906)에 세워졌음을 알 수 있다. 이 장승은 험상궂은 듯 하면서도 친근하고 익살스러운 민간 특유의 조형미를 보여주고 있으며 유례가 드문 독장승이라는 점에서 그 가치가 높다. 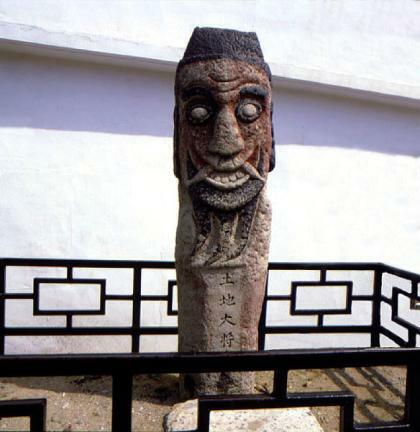 This stone guardian post stands on the right side of the road leading to Sebyeonggwan Hall (National Treasure No. 305). 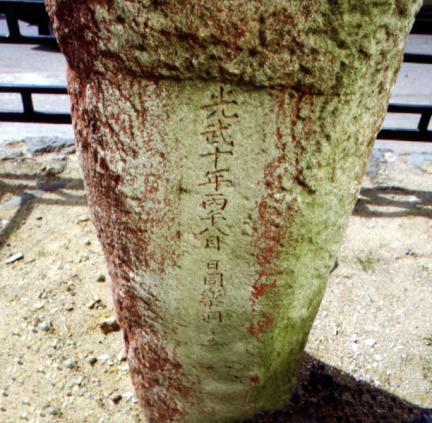 As an element of folk belief, guardian posts served to draw boundary lines at the entrance to a village or a Buddhist temple, and were thought to repel evil spirits. Unlike typical guardian posts, which form a pair consisting of a male and a female, this particular guardian post stands alone. It was erected to reinforce the vital energy of the area, a low valley surrounded by mountains, and to wish for the well-being of the village. 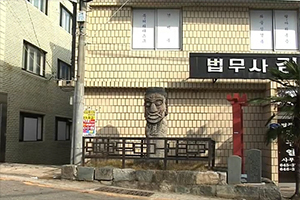 Guardian posts were referred to by different names according to their locations, and were commonly called “beoksu” in this area. The face on this guardian post has a deeply wrinkled forehead with bulging round eyes and a stumpy triangular nose. It is wearing a hat and has a goatee beard depicted by three strokes under its chin. 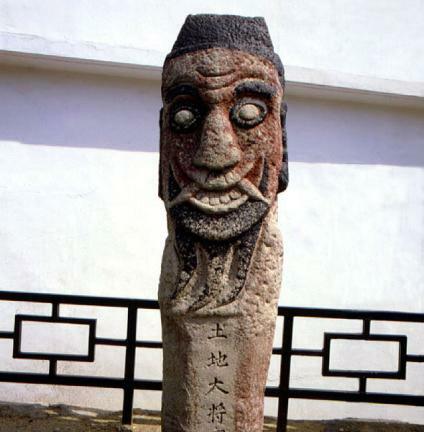 Its broad smile reveals long canine teeth, which look humorous rather than rough, and the name Toji Daejanggun (“Great General of Earth”) is inscribed on its body. 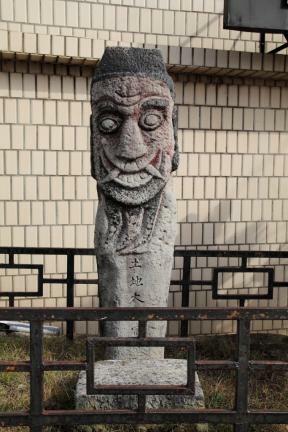 Erected in 1906, this guardian post is invaluable as one of the few exceptional solo posts, as well as for its friendly, hilarious and yet rugged form that is so characteristic of the folk arts.